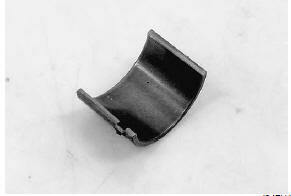 Place the plastigauge axially along the balancer shaft journal as shown. never rotate the balancer shaft when a piece of plastigauge is installed. 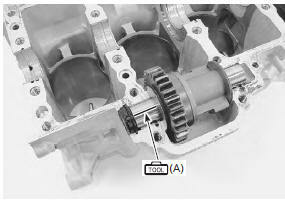 Mate the lower crankcase with the upper crankcase, and tighten the crankcase bolts (m8) and crankshaft journal bolts (m9) to the specified torque. Remove the lower crankcase and measure the width of the compressed plastigauge using the envelope scale. This measurement should be taken at the widest part of the compressed plastigauge. If the oil clearance exceeds the service limit, select the specified bearings from the bearing selection table. Check the corresponding crankcase journal i.D. 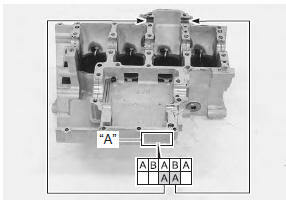 Code number “a”, [a], [b] or [c] which is stamped on the rear of upper crankcase. the balancer shaft journal bearings on upper and lower crankcases are the same.